What Can We Learn About Business from Henry Ford? Henry Ford is one of the most famous businessmen of all time. American industrialist and founder of the Ford Motor Company, his foresight revolutionized the transportation industry and enabled many people to purchase their first car. But what relevance do Henry Ford’s methods and work ethic have today? What can a one hundred year old process teach us about being better entrepreneurs and business owners in the modern age? Well, perhaps surprisingly more than you imagine. In this post I want to highlight some of the methods Ford applied to his business endeavors and look at how they can help us all become more successful. At the start of the twentieth century Henry Ford brought the assembly line technique to the world of automobile production. The technique was so successful it allowed mass production on an unparalleled scale. However, it is important to remember that Ford was not an inventor; he was an innovator. He did not invent the automobile or the assembly line but he did revolutionize the way in which they were produced and utilized. He had the vision to take something which already existed, improve it and re-sell it as something new. This can serve as an important lesson to anyone who is stuck for ideas, as he proved that reinventing the wheel (no pun intended) isn’t necessary when modification and improvement can serve us equally as well. It’s about having belief in the power of professional vision and understanding how to capitalize on opportunities. Great entrepreneurs not only put ideas in motion but they commit to them mentally as well. Having an amazing idea is all well and good but seeing it through to the implementation and execution phase is just as important. What helped Ford become so successful was establishing his company as a leader in what was then a niche market. Just as we are often advised today, finding your niche is really important. A “generic” freelance writer might struggle to win contracts, but if they marketed themselves as a freelance writer specializing in producing training manuals or composing funding bids for non-profit organizations, they’d probably have more luck. The overriding lesson is clear: do some research, establish that there is an interest/need for your product or services and learn to listen so you can focus on developing what you have to offer. As well as identifying your target market it is also vital to keep in mind the importance of promotion and how you sell your services or product. When the Model T Ford was introduced on October 1st 1908, Ford set about creating a huge publicity campaign that would ensure every available newspaper would want to carry stories and adverts about the new product. A combination of clever marketing and a rapidly growing positive reputation meant that by 1918, half of all cars owned in America were Model T’s. Obviously we are talking about a much smaller scale here, but how you engage with potential clients and customers is just as relevant. Having a good website, regularly updating your blog and keeping up a strong presence across social media sites are all ways in which you can self-promote at very little cost. Something as simple as overhauling your company ‘About’ page or writing a guest post for a relevant site can help to give your business a boost. When you’re self-employed, reputation is everything, so ensuring that you are functioning at the top of your game at all times is essential. Reputation and recommendation is often built through word of mouth so consistency and quality of service must remain the same across every client you work with. Henry Ford’s assembly line method ensured that the thousands of cars produced were identical in terms of style, quality and reliability. He understood the power of customer satisfaction and the spoken word and he instilled his principles into his workforce. Ford once famously said, ‘Quality means doing it right when no one is looking’, and it is true because your work ethic should always remain unchanged. But quality isn’t just about execution; it’s about embracing the idea as a mind-set and making it a habit that sits at the very center of the service you offer. Cutting corners or providing substandard work will catch up with you eventually and could damage a hard-earned reputation. The business world is by design results-based, so creating and maintaining a dependable persona is integral to success. Failure is something that will come to all of us at some point but it is how you deal with it that sets you apart from everyone else. 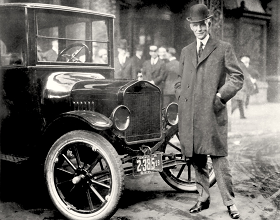 Henry Ford actually had two motor companies before Ford. Both failed and resulted in bankruptcy but he had the determination and belief in his idea to carry on. He sucked up his mistakes and learned by a process of careful observation and trial and error. Ford was a huge believer in the power of working efficiently. Today he is credited with the modern concept of Fordism. Fordism is a system based on an efficient, standardized form of mass production. In short, Ford realized that by keeping the efficiency of his workers at a premium level he could achieve the maximum level of output. He achieved this by incentivized loyalty through better wages and a reduced workweek. But hold on — doesn’t that sound a little familiar to us as businesspeople? As entrepreneurs we strive to work the minimum number of hours for the maximum reward. As we’ve discussed previously, by eliminating inefficiencies you can increase your proportion of billable hours which ultimate results in a higher equivalent hourly rate. As the 80/20 Principle teaches us, 20% of the input creates 80% of the output, or in simpler terms: targeted, effective work beats generalized, hard work every time. Ford was big on learning and professional development. Before he started the Ford Motor Company he trained as an apprentice engineer by day and studied book keeping at night. He knew which direction he wanted his life to take and he made long-term, calculated plans to get there. He switched jobs often believing that once he had learned all he needed to know it was time to move on to something more challenging. He was not content to simply be. For us this is a good reminder of the importance of learning and adapting to trends within our chosen industries. An idle moment could mean a missed opportunity. Evolving through learning can spark off new ideas, meaning it is also necessary to adapt and amend your goals. Sometimes this can lead to self-doubt but be reassured that change is a natural by-product of professional growth and doing the work you love will give you the strength to overcome anything. Just look at Ford. When he was young it was expected that he would take over the family farm after his father retired. But it was work he despised and he later wrote that the only thing he loved about life there was spending time with his mother. He broke away from the traditional mold and bucked the expectation that society had placed on him so that he could follow his dreams. This is an idea that resonates with many entrepreneurs who have branched out and had the courage to try an alternative career path, even in the face of doubt and criticism from others. As we’ve discussed before, regardless of the ultimate goal, most self-employed people are united in the fact that they gave up regular employment to pursue a better work-life balance where there’s the opportunity for uncapped earnings as well as more free time for family, hobbies, or other interests. Goal-setting and keeping sight of your dreams is important as it keeps you focused and motivated to drive your business forward. It can be scary when you’re going it alone, especially if like me you gave up a secure, relatively well-paid job to do so, but the fact that you’ve already had the determination to make the break should give you the reassurance that you’ve got what it takes to make it. Although aspects of Ford’s personal life (such as his political views and anti-Semitic leanings) made him a divisive and somewhat controversial character, his impact on the business world in both a practical and theoretical sense cannot be denied. In using his foresight and tenacity to succeed, the production system that Ford created epitomized the efficient, systemized, successful model that all business owners, entrepreneurs and freelancers strive for today.